The future is looking bleak for these businesses. Consumer preferences are constantly evolving, which naturally creates winners and losers. Companies that successfully adapt to the changing times can thrive at the expense of those who are dependent on outdated business. With that in mind, we asked several of our Foolish contributors to highlight a company that they think is in trouble and could be gone in a few years time. Read on to see which companies they choose and why. Brian Feroldi: Every retailer has been forced to deal with consumers shifting more and more of their purchases to online channels, and some have dealt with it better than others. 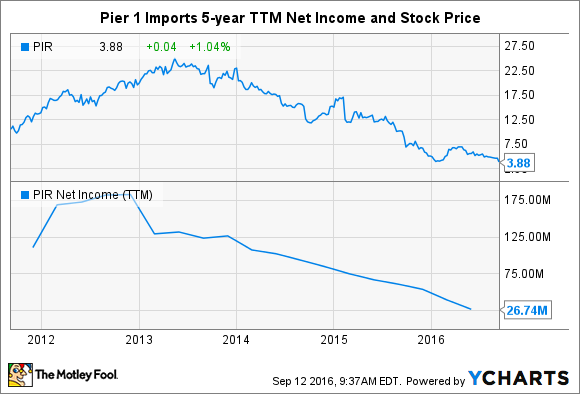 Pier 1 Imports (NYSE:PIR), a retailer of specialty home-goods, has struggled to adapt the changing times. That's led its comparable-store sales to wane over the last few years, and with a huge store base to support, the company's profits have evaporated. Those factors have taken quite a toll on the company's share price. Results from the company's just-completed quarter show that efforts to revive sales are not working. They were so bad that management decided to pre-announce them, stating that sales were going to drop about 6.7% on the back of comps of negative 4.3%. That's expected to give the retailer a net loss for the quarter, its second in a row. If that wasn't bad enough, the company has taken on more than $200 million in debt to fund its share-repurchase program, turning an otherwise pristine balance sheet into one that now has almost twice as much debt as cash. There are also now big leadership questions following the recent news that the company's longtime CEO has decided to step down "to do something new." Unfortunately, I have a hard time seeing how the company successfully steers out of this tail spin. After all, it's not like e-commerce players like Amazon and Wayfair are going to disappear anytime soon. Given all of that, it wouldn't surprise me to see this retailer gone from the public markets by 2020. Daniel Miller: If you've found yourself walking the crowded Las Vegas Strip lately, you likely wouldn't guess the pain Caesars Entertainment (NASDAQ:CZR) has found itself in over the past few years. But if you're looking for a company that might not be around by the end of this decade, Caesars appears to be a good bet. After the company formerly known as Harrah's Entertainment went public in 2012, it immediately posted losses nearing $3 billion annually during 2013 and 2014, and was carrying a highly leveraged balance sheet to boot, all before management began warning of financial trouble. Then things got weird. Caesars began to play a game of musical chairs, shifting assets and liabilities around its subsidiaries. This eventually led to a collection of good assets in one business, and a sizable chunk of liabilities in another. The moves, allegedly, seemed to indicate Caesars was planning to let its liabilities go bankrupt with its Caesars Entertainment Operating Co. (CEOC) while keeping its valuable assets under other subsidiaries. As you can imagine, that didn't go over well with shareholders. Now it appears shareholders will have their day in court: A stay of $11 billion in bondholder lawsuits is set to expire Sept. 16, giving Caesars only a little more time to strike a settlement and potentially emerge from this ugly mess without needing to file for bankruptcy. Make no mistake, Caesars posted a solid second quarter despite regional gaming woes, but where there's smoke there's fire, and this will continue to be an bad situation for the casino giant that could threaten its 2020 existence. Too late for a turnaround at Sears-Kmart? Sean Williams: I would be jaw-on-the-floor shocked if Sears Holdings (NASDAQOTH:SHLDQ) made it to 2020 based on its ongoing business woes and dismal balance sheet. Despite a veritable laundry list of store closures -- the company announced more than six dozen in April alone – and a renewed focus on modernizing its most profitable stores, Sears and Kmart simply can't gain any traction. During the second quarter, the company announced that Kmart's same-store sales declined 3.3%, while Sears' domestic store revenue dropped 7% from the prior-year period. Perhaps more telling is that this continues an 11-year trend of declining same-store sales for the Sears-Kmart combination. Since 2010 alone, the company has lost more than $8 billion. With clear business-model issues also come financing concerns. Sears Holdings wound up tapping a $300 million secured junior lien against its inventory, receivables, and other working capital from ESL Investments, a hedge fund founded and run by Eddie Lampert, who is also CEO of Sears. ESL has also previously backed a $250 million debt tranche for Sears Holdings. Since the beginning of the year, Sears Holdings' long-term debt obligations have ballooned from $2.2 billion to $3.4 billion, while its cash on hand has jumped by just $38 million to $276 million. In other words, Sears' weak balance sheet could thwart its only chance to renew the image of its most profitable stores. Perhaps the only path to recovery for Sears Holdings is to consider selling its core brands, such as Craftsman, Kenmore, and Die Hard. Doing so would likely bring a major relief to Sears' balance sheet, which could allow the company the opportunity to completely modernize its stores. Unfortunately, it could also remove a big incentive for the few loyal Sears customers that remain to return to those stores, and really crush any opportunity for near-term growth. Sears Holdings and Eddie Lampert have a number of tough decisions ahead of them, but my suspicion is the company may not live to see the turn of the decade.